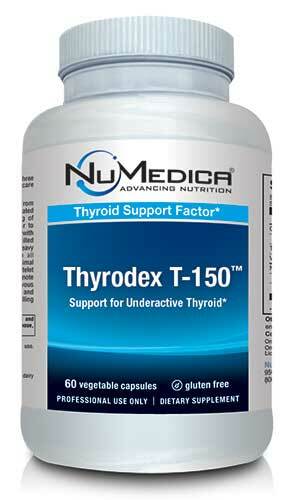 NuMedica Thyrodex T-150 supports healthy thyroid function. By enhancing and improving thyroid function, this supplement may have a positive effect on energy levels, appetite, and weight management. To work, this supplement combines BSE-free bovine glandular thyroid along with several herbal and nutritional supplements. 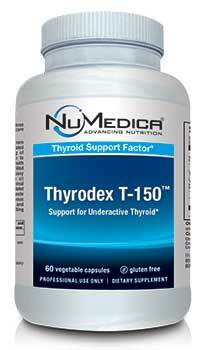 NuMedica Thyrodex T-150 includes L-tryosine and iodine, both of which improve thyroxine levels in the body. This is an essential process in converting thyroxine to bioactive triiodothyronine (T4 to T3), which ensures proper thyroid levels within the body. With a balanced thyroid, users may feel more energetic and have a faster metabolism. In addition to l-tryosine and iodine, this product contains Vitamin A, B-2, calcium, magnesium, zinc, manganese, potassium, thyroid and other natural ingredients. A key component in NuMedica Thyrodex T-150 is L-tyrosine. L-tyrosine is a type of amino acid. Within the body it works as a building block of protein. It is naturally found in dairy products, eggs, meats, and fish. This product can work to help people with the inherited disorder phenylketonuria (PKU), in which the body cannot process phenylalanine in the right manner, which means they cannot produce tyrosine. This product works as a supplement to rectify this situation. NuMedica Thyrodex T-150 also contains iodine. An iodine deficiency is one of the most common causes of an improperly working thyroid gland. Those who do not have enough iodine in the body cannot produce enough thyroid hormone, a hormone which works to control virtually all organs in the body. This product works to restore the balance of this nutrient in the body to ensure the thyroid gland can work properly to produce hormones to control the cells and other systems within the body. The other ingredients in this product can work to stimulate the thyroid gland while also meeting the basic metabolic needs of the body through electrolytes. These nutrients are necessary for immune health, energy, and cell rebuilding. Directions: One capsule daily or as directed by your healthcare practitioner. Proprietary Blend Contains: Adrenal (freeze dried), pituitary (freeze dried), spleen (freeze dried), thymus (freeze dried), Irish moss seaweed (Chrondus crispus), parsley leaf (Petroselinum crispun), horsetail herb (Equisteum arvense). Other Ingredients: HPMC (vegetable capsule), rice powder, magnesium stearate. What is the country of origin for the bovine in the Thryodex T-150? I'm wondering if you could explain a little bit more about the bovine glandular thyroid supplement, and what it is biologically. Is it a T4/T3 combo? if so, what is the dosage in mcg's? Yes. Safe for Men and Women. See the Directions tab.